Some important themes have emerged from the recent Cambodian general elections – both good and bad. The bad news is that the post-election period was, on some level, more of the same. There were accusations of irregularities and voter fraud, not to mention reports of intimidation and threats to opposition activists in major provinces across the country. Prominent ruling party members issued grim warnings of civil war should the opposition win, while mass demonstrations challenged the flawed election results, which saw Hun Sen confirmed as prime minister this week. The good news is that political leaders of all stripes recognize the authentic power of young voters. 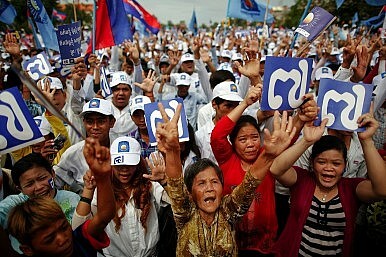 With more than 50% of Cambodia’s population under the age of 25 and 70% under 35, it would be perilous to ignore them. In fact, that would be a surefire way to lose in five years. Unlike their predecessors, a healthy proportion of young Cambodians aren’t paralyzed by fear. They aren’t consumed by the country’s war-torn past; rather, they are gravitating toward the prospect of building an economically vibrant Cambodia. A more good news: young people have turned to social media (Facebook, YouTube, Twitter, among other outlets) to mobilize for change. This is the new status quo. This is the new Cambodia. Prime Minister Hun Sen’s youngest son, Hun Many, understood the importance of appealing to youths. But his approach was flawed. Too often the appeal was to the “why” or “what” and not the “how.” How will the Cambodian People’s Party (CPP) (or the Cambodian National Rescue Party (CNRP), for that matter) create jobs for youths? How will leaders increase wages for civil servants, and how will they actually pay for those increases? Young people don’t care about the “why” or “what.” They already have those answers. The focus ought to be on how opportunities will be created to close the gap. Similar to young millennial-type voters across the globe – young Cambodians aren’t pledging allegiance to the party – but rather to the agenda. In America, we call them Independent voters. If promises are made and then broken to youths, major parties should brace for another power struggle in 2018, with seats going to the next best candidate who delivers on promises. That you most certainly can expect. Alarmists often suggest a possible “Arab Spring” in Cambodia. While this isn’t likely, despite a large disgruntled youth population, there is reason to believe that major shifts will occur in government policies, in phases over the next five years. One obvious change didn’t take very long. It was the recent announcement of a 30% pay raise for about 90,000 low-paid civil servants. That happened just ten days after the election results came out, with more than 20 seats occupied by the ruling party lost to the opposition. Civil servants have typically aligned with the ruling party, so the pay hike was certainly a wake-up call. Another inevitable change will focus on bridging the education-workforce gap for young people. There can be no compromising here if leaders want to stay in power. Disheartened youths are speaking out about this in public forums such as Facebook. How that actually unfolds remains to be seen. But the new government must double down on these policies, now. As more youths graduate without jobs, patience will wane. We are seeing this happen across the globe, and Cambodia isn’t immune to this. An important trend emerging in the country is the acquisition of two concurrent bachelor’s degrees. Students believe this increases the probability of landing good jobs after college. In reality, though, many young people remain broke and unemployed after graduation, with a growing number believing it’s “who you know” not “what you know” – questioning the true value of a college education. That isn’t a good precedent to set, especially for a country mired in poverty and with a huge ambition to integrate with larger ASEAN economies by 2015. Most college-educated youths live and work in major cities, especially Phnom Penh and Siem Reap. It’s no surprise National Assembly seats (particularly in those provinces) were swept by the CNRP, who made promises of change or b’do. But the CNRP too will need to put their words into action.